For some readers, this will just be a mean tease. 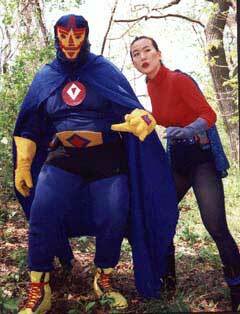 But, back in the mid-’90s, filmmaker Pat Bishow created an awesome series of short superhero films called The Adventures of El Frenetico and Go-Girl, about a fat, drunken Mexican wrestler and his spunky, kung-fu-ing sidekick. Bishow used to sell the films on one VHS tape that has since disappeared from the marketplace. Above is a compilation of clips from the series that Bishow uploaded to YouTube a few years ago. Although I’ve strung all of these clips into one long-running playlist — it probably runs about 9 to 10 minutes long total — I don’t want to give the impression that Bishow meant to be seen in this order. I just like the way they flow in the order I put them in. The clips come from all different films in the series and don’t have much connection, plus there’s the opening credits and a few promotional videos thrown in. It should give a good feel for how the overall series played. I believe I got acquainted with the films through Mike White’s legendary film zine Cashiers du Cinemart and his original review of the films is online. This was also probably pre-Underground Film Journal, so I never wrote about them online myself, although I’m trying to make up for that with this. You can also see some of Bishow’s other work at his Amusement Films YouTube channel.